Coming to Jefferson? Here’s a sneak peek of a new design just for Wisconsin Sheep & Wool. My booth is open Friday through Sunday, see you there! This entry was posted in Uncategorized and tagged events, jenniethepotter, sheep dog, wisconsin, yarn bowl on September 6, 2012 by Jennie. JENNIE!!!!!! 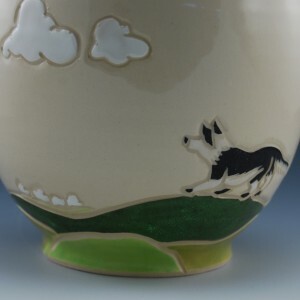 Don’t be selling all my border collie pottery!!!! Sign up for jenniethepotter's update list! Receive an email to know when Jennie will have work available for sale.